Being the premier amateur archaeology blog on the web, I have decided that it is high past time that I start posting some professional archaeology on here as well. I’ve decided to start that with a series of interviews. 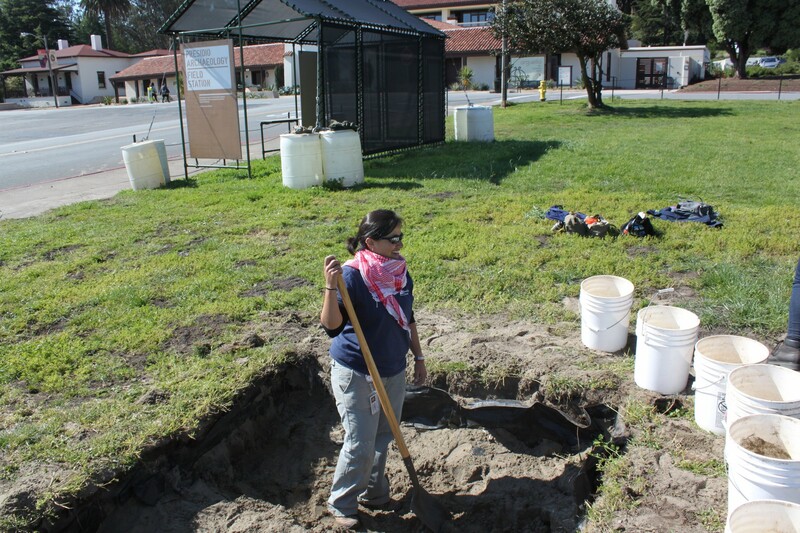 To start us off on the right foot, here is Juliana Fernandez, whom I had the pleasure of meeting at the Presidio archaeology dig. Without further ado, here is our interview! 1) What’s your name, and what do you do at the Presidio? 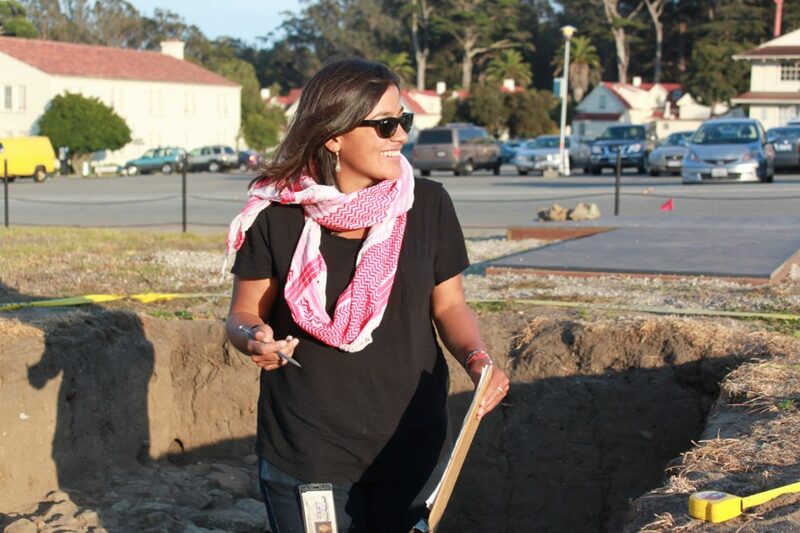 My name is Juliana Fernandez and I am a Heritage Technician (basically an archaeologist) for the Presidio Trust Heritage Program. I do a variety of things but I mostly do public excavations at Pershing Square where we are currently excavating the western wing of the 1815 Spanish-colonial fort. Half of the year is spent outside doing fieldwork and the other half we do post-processing and analysis of our finds and planning for the next field season. In addition to that, I do compliance work around the park to ensure that cultural resources are protected whenever there is construction work. I also get to work with very talented individuals that plan new exhibits, put together free public programs such as concerts and dialogues, and collaborate with our educators and help out with field trips with kids of all ages. 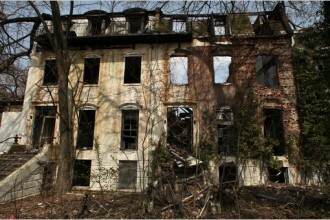 2) Can you give us a short rundown of the history of the Presidio? El Presidio de San Francisco was initially settled in 1776 by 193 men, women, and children who traveled from what is now northern Mexico. The post was situated at the northernmost edge of Spain’s North American colonies, and was integral to Spanish efforts to consolidate and expand its control of the region. While the post’s fortifications warded off foreign competitors, the people of El Presidio became part of a larger community that included local missionaries and California Indians. El Presidio represented Spain, and later Mexico, until the garrison was moved further north to Sonoma in 1834. Several remains of the adobe fortification were still standing when the American army took over in 1848, becoming an American military post until 1994 when it was decommissioned and turned into a national park. 3) What’s the most interesting tidbit you’ve learned from your work here? That you learn something new about this place every day, either from a colleague or from a park visitor. You never know what a site visitor or a docent can teach you and it’s always something interesting or a fun fact about this place that I didn’t know before. Every day is different and full of surprises. 4) If there’s one thing you could get the public to learn, about the Presidio or about archaeology in general, what would it be? I would definitely want them to know that archaeology is everywhere, even in a city such as San Francisco, and although excavations are perceived as the most important part of archaeology, the post-processing and lab work is really where we spend most of our time and where we get to put together the story of the past. 5) How can the public get involved? 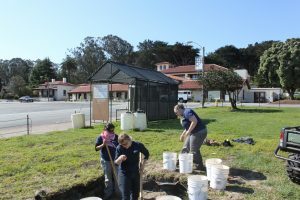 Well we primarily encourage the public to come out and visit us while we are out working so that they can learn about the history of this place and the archaeological process. We also have a variety of volunteer opportunities that offer different levels of engagement with our project. We have a large community of volunteers who help us do non-technical tasks such as wet-screening, flotation, and washing/sorting artifacts. We also have docents at the site, and they play an integral role in orienting our visitors and giving background information about our project and the Presidio’s history. We also have residential volunteers, our interns, who work with us for 10-12 months and are individuals with their Archaeology/Anthropology BAs. Anybody can get involved really, it’s just a matter of deciding how involved you want to get. 6) Is there anything else you’d like to say? If you’re in the Bay Area, do come to the Presidio and check out our site! Our public hours are Fridays and Saturdays 10am to 2pm. We also do Archaeology Lab tours every Wednesday 1-2pm, followed by open lab hours 2-4pm. We have an Instagram account where we post weekly photos so if you’re interested feel free to follow us: @presidioarchlab. Hope to see you all out there!